Louisa May Alcott was an American novelist who is probably best known for her novel Little Women. She was a feminist and abolitionist who never married. Louisa May Alcott grew up around, and was educated by, many well known writers and intellectuals of her day. Her early educators included Henry David Thoreau, Ralph Waldo Emerson, Nathaniel Hawthorne and Margaret Fuller. Considering that he was one of Louisa May Alcott's early educators, it seems only fitting that poet Ralph Waldo Emerson can be found among her famous kin. Other literary kin include poet Henry Wadsworth Longfellow, author and playwright Tennessee Williams, poet Emily Dickinson, poet Robert Frost, author Ernest Hemingway, and a number of other literary greats. Louisa May Alcott has a number of U.S. presidential kin that includes John Adams, John Quincy Adams, Franklin Pierce, Grover Cleveland, Gerald Ford, Rutherford B. Hayes, Warren G. Harding, Franklin D. Roosevelt, and both Presidents Bush. She also has kinship to the current royal family through a connection with Princess Diana. 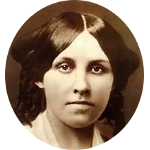 Louisa May Alcott has kinship to a number of celebrities that includes, but is no limited to, Shirley Temple, Ellen DeGeneres, Linda Hamilton, Humphrey Bogart, Katharine Hepburn, Grace Slick, Paget Brewster, Ben Affleck, Ted Danson, Janis Joplin, Kim Kardashian, Alec Baldwin, Lee Remick, Jodie Foser, Clint Eastwood, and Hugh Hefner.